but seriously, I mean...doesn't anyone have that one My Chem song where they rock out like red head? But yes, sadly...that is probably what I look like when I go to shows. I read "Intense Lotms Redheaded Kid Search-party" as "Intense LOTR Redhead Kid Search Party". My mind conjured images of redheaded kids searching for LOTR-related things. 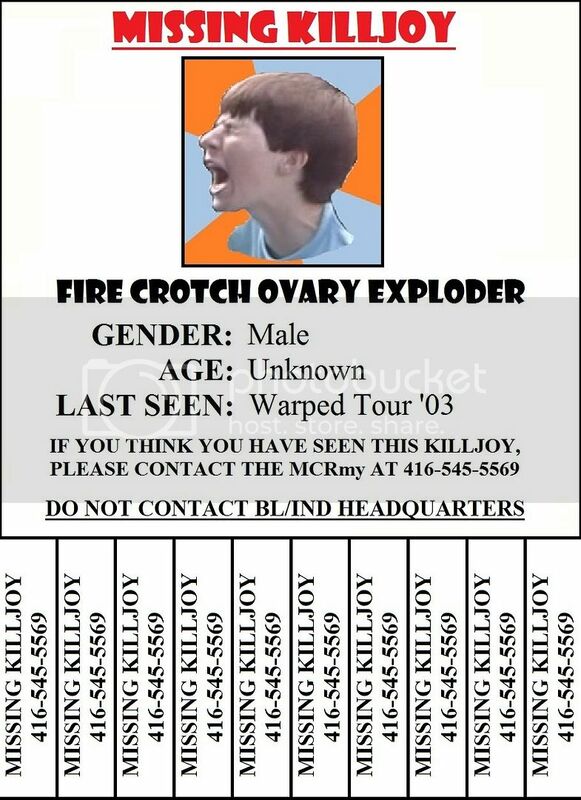 I burst laughing every time i see his killjoy name! What if someone from BL/I kidnaps him for ransom?! ... Then we have to bust in and get him back! I mean, come ON. The awesomeness of FIRE CROTCH OVARY EXPLODER cannot fall to BL/ind's control! Yes, his name is just so awesome it has to be said in full caps. And bolded. Then again, he just looks so awesome, it's like... if BL/ind tries to kidnap him he'll destroy them all with his sheer intensity. He'll be like ROAR and they'll be forced to let him go. I hope to God one day this kid/ now adult finds out his killjoy name. Well, I made a poster but it looks like a "Lost Pet" one more than a "Missing Man/Child". Actually, I based it off a lost pet poster, so I really don't know what I'm talking about. Because I can't attach it, here's a link to my POSTER. Keep in mind that you phone the number I put some angry lady will probably answer and be like >8C RAWR STOP PHONING ABOUT FIRE CROTCH OVARY EXPLODER. I've always wondered who he was. I want in! What if his hair isn't red anymore?! it will be a loss to all redheads everywhere. this is so funny! hope we find him... hes God. Dear god, I love that kid. He should be our mascott or something. One of us should personally tell him that he is now the cause of a sub-cult within the MCRmy. I seriously thought I was the only one to notice this kid... He is a legend. We also need a wxy to prove it's him. Cuz if any BL/ind agents try and infiltrate… it'll be DANGER DAYS!! !